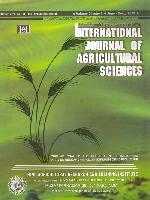 International Journal of Agricultural Sciences (Internat. J. Agric. Sci.) is an official publication of the Hind Agri-Horticultural Society. It features the original research in all branches of Agricultural and other cognate sciences of sufficient relevance. The journal publishes three types of articles. i.e. Review/Strategy paper (exclusively by incitation from the personalities of eminence) Research paper and Short communication. The manuscripts should be submitted in triplicate with CD completed in all respect to the Editor, International Journal of Agricultural Sciences, Hind Agri-Horticultural Society, Ashram, 418/4-South Civil Lines (Numaish Camp), Muzaffarnagar-251001 (U.P.) INDIA. Clearness, brevity and conciseness are essential in form, style, punctuation, spelling and use of English language. Manuscripts should conform to the S.I. system for numerical data and data should be subjected to appropriate statistical analysis. On receipt of an article at the Editorial Office, an acknowledgement with a number is sent to the corresponding author. This number should be quoted while making any enquiry about its status. All the authors have to become the annual member of the Journal. Review/Strategy paper : It should be comprehensive, up-to-date and critical on a recent topic of importance. The maximum page limit is of 16 double spaced typed pages including tables and figures. It should cite latest literatures and identify some gaps for future. It should have a specific Title followed by the Name(s) of the author(s), Affiliation : Address of the institution(s) where the research was undertaken and corresponding author with address. Abstract : A concise summary (200 to 300 words) of the entire work done along with the highlights of the findings. Key Words : Maximum five keywords to be indicated. Results and Discussion : This segment should focus on the fulfillment of stated objectives as given in the introduction. It should contain the findings presented in the form of tables, figures and photographs. As far as possible, the data should be statistically analyzed following a suitable experimental design. Same data should be presented in the table and figure form. Avoid use of numerical values in findings, rather mention the trends and discuss with the available literatures. At the end give short conclusion. Insertion of coloured figures as photograph(s) will be charged from the author(s) as applicable and suggested by the printer. Khanna, K., Arora, J.S. and Singh, J. 1986. Effect of spacing and pinching on growth and flower production of carnation (Dianthus caryophyllus L. cv. Marguerite Scarlet). Indian J. Hort. 43:148-152. Mishra, M., Mishra, S.N and Patro, G.J. 2000. Effects of depth of planting and mulching on rainfed turmeric (Curcuma longa). Indian Journal of Agronomy, 45(1): 210-213. Patel, K.S. and Arora, J.S. 1986. Effect of pinching, source and dose of nitrogen on the growth and flower production of carnation (Dianthus caryophyllus L. cv. Marguerite White). Indian J. Hort. 40(1-2): 92-97. Patel, S.N. 1995. Knowledge and adoption of drip irrigation system by the farmers of North Gujrath, M.Sc. (Agri.) thesis G.A.U. Junagadh, Gujrat. Short Communication: The text including table(s) and figure(s) should not exceed five pages. It should have a short title; followed by name of author(s) and affiliation and references. There should be no subheadings, i.e. Introduction, Materials and Methods etc. The manuscript should be in paragraphs mentioning the brief introduction of the topic and relevance of the work, followed by a short description of the materials and methods employed, results and discussion based on the data presented in 1 or 2 table(s)/figure(s) and a short conclusion at the end. References, should be maximum of seven in Nos. at the end. b) CD of the above printed copies. Processing fee Rs. 100 per research paper/article. Membership fee for each author. It is mandatory to purchase at least 10 prints. At the bottom of first page, address of the corresponding author, Tel. No. Fax No. and E-mail ID etc. must be specified. Article forwarded to the Editor for publication is understood to be offered to International Journal of Agricultural Sciences exclusively. It is also understood that the authors have obtained a prior approval of their Department, Faculty or Institute in case where such approval is a necessary. Acceptance of a manuscript for publication in International Journal of Agricultural Sciences shall automatically mean transfer of copyright to the Hind Agri-Horticultural Society. The Editorial Board takes no responsibility for the fact or the opinion expressed in the Journal, which rests entirely with the author(s) thereof.